There are many simple and easy actions that we can take to participate in the conservation efforts of Indonesian forest and wildlife. Stop thinking that nature conservation efforts always require a lot of money, or have to look fantastic. Small actions are far more meaningful than big talks. You can come to schools, campuses, or communities (like youth groups, community of interest, etc.) to promote forest and wildlife conservation issues. The methods are up to you, for instance by giving presentation or play movies. You can get the materials for presentations (PowerPoint slideshows) and the films (in DVDs) for free. Please contact PROFAUNA by email to: international@profauna.net to consult about this. Do not forget to take the photos of your education activity and send it to PROFAUNA. We will publish it in our website and social media accounts to inspire the others to join the movement! Deforestation and wildlife crime cases sometimes need demonstration in order for the public, press, and authorities to pay more attention. It does not have to me conducted by a lot of people; even 5 people are enough to attract public's attention if it is presented in a unique way. Demonstration in public places is only one way to campaign for an issue. Non-violent demonstration is every citizen's right, and it is protected by the law, so do not have to be worried or afraid! 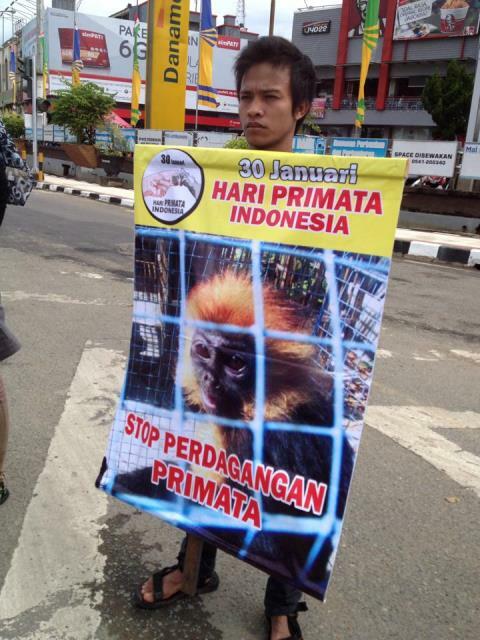 Please consult PROFAUNA to get suggestions and tips on organizing a demonstration. If you find news related to forest and wildlife crime, write a protest letter to the concerning bodies or authorities asking them to do something about it. You could also write an article or opinion and send it to the editor of the newspaper. After that, you can also spread your opinion through social media. Social organizations like PROFAUNA often need volunteers to assist in their programs. On your day-offs or holiday, you can do something worthwhile like being a volunteer. It is so futile to spend your holiday at home doing nothing. Make your holiday more memorable by being a volunteer!